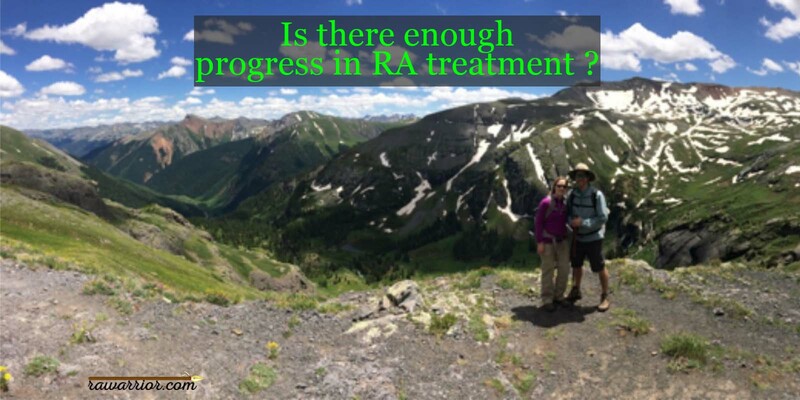 In this provocative guest post, RA Warrior welcomes Dana Symons, who asks whether we’ve reached A Plateau in RA Treatment Progress. If you’re like me, you’ll wonder why other news outlets haven’t asked these questions. But first, Dana is the talent behind many RD awareness graphics provided by the Rheumatoid Patient Foundation (RPF) and the current vice president of the non-profit. Dana has attended the American College of Rheumatology annual scientific meeting five times to help represent patients via RPF. Today, she brings you the unique perspective of a patient with a front row view of rheumatology research and clinical practice. 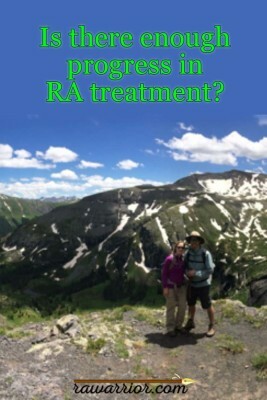 How did we reach a plateau in RA treatment progress? Over the past couple of years at ACR, I seemed to notice a trend. There are tons of scientific sessions discussing a multitude of topics that affect those practicing in the field of rheumatology. However, it seemed that there were fewer talks being given specifically on rheumatoid arthritis. Perhaps that’s just my perception and I’m wrong—I did not make any attempt to categorize and count the sessions over multiple years! Perhaps it’s because we had several years in a row with big news—new drugs coming to market, new biomarkers being discovered, new recommended guidelines from the ACR, including diagnostic criteria and Treat to Target initiatives—followed by years with less news. Sure, there are biosimilars and a few new drugs in the works, but nothing seems completely novel. There was certainly still a plethora of research; yet, the emphasis and enthusiasm for progress with this disease did not seem to be there. Perhaps everyone is just waiting for the “next big thing.” For whatever reason, to me there seems to be a sort of plateau. And plateaus are dangerous. It’s the serious weight loss regime that can’t get you past the first five pounds. It’s the career progress that suddenly halts at a dead end job. It’s the relationship that blossoms, and then grows stale. And, speaking from experience, sometimes, it’s as far as getting 2/3 up the mountain you wanted to climb, past the miles of steep winding switchbacks—into the lower basin. While pretty, with its streams and waterfalls, and tempting with its flat path for easy walking—if you stop at this plateau and don’t keep going, you will never reach the pinnacle—you will stay on the plateau of complacency and never know that which is truly spectacular. A plateau means you’ve made progress, but you haven’t reached the end. There has been significant progress in treating RA / RD in the past decade or two. Biologic medications have been a game changer for many. New treatments targeting different pathways, new biomarkers indicating disease activity and helping diagnostic and prognostic efforts and a shift toward more patient-centric care are all very positive things. However, there remains a large portion of people with rheumatoid disease (PRD) that is unresponsive to any available treatment, and the mortality gap still exists. Just because we have made progress, it doesn’t mean it’s time to stop and call things “good enough.” Just because some patients are doing well who would not have been 20-30 years ago, doesn’t mean we ignore the patients who still are not doing well. There is a pervasive sense that, on average PRD are doing well, and we can all put our feet up and relax a bit. The problem with that thinking is that there is no “average” patient. The statistical mean of a group of people may be helpful for exhibiting overarching trends, but is not helpful to an individual. It does not address the concerns of a single person, who may, in fact, not be doing well. We still have a long ways to go in rheumatology, with yet a poor understanding of how the disease even develops, functions and evolves. Until we are able to understand this disease better, to screen and diagnose early, to universally recognize and treat the systemic nature of RD—we will never be close to being done. I say “we” because I mean all of us: patients, caregivers, doctors, nurses, researchers, pharmaceutical companies… we all play a role in advocating for better research funding and proper attention to this cruel disease. I am here to remind you that we are not done. Now is not the time to give up. Now is not the time to plateau. Now is the time to build upon the momentum that we have and continue to fight until we live in a world where no one suffers from rheumatoid disease. Sometimes advertisements for RA treatments make it seem as if it’s a problem that’s already solved. Hearing from many thousands of patients, I knew that we still have a long way to go in RA treatment progress. But as I worked on my book, RA Unmasked, I learned how very true this is—especially in terms of systemic disease effects. BOGO! Amazon has the paperback of Rheumatoid Arthritis Unmasked on a holiday sale for $13.88 and the Kindle version is included free. You’ll have one to read and one to loan out to a doctor or family member. DO YOU THINK PEOPLE HAVE BEEN HELPED ENOUGH BY CURRENT MEDICINES AND METHODS IN RHEUMATOLOGY? WHAT SHOULD BE DONE? Somewhere along the line medical people,researchers,pharmaceuticals join lay people in believing nonsensical commercials. Don’t you know a pill or a jab and PRODcan run on the beach with their dog and prepare a lovely meal and entertain. All in one day,,, no sweat, no pain, no payback? They need to look in different directions. The research completed to date has definitely plataued due to researchers constantly looking in the same or similar areas of immune system suppression. They need to go back to the beginning and start looking for the cause again. Current research streams are stuck in a loop. We need fresh eyes on this urgently! I have lived with this disease for at least 30 years.I take a biologic and also plaquinil daily. This helps but is not enough to stop the progress of this disease. We who have RA usually have other auto-immune diseases as well. Because of my age I am not able to take any pain medicine except over the counter like Tylenol. So I live with pain daily. Until there is a cure for RA and the other auto immune diseases there should never be a stop to the research. I pray for a cure for this every day and for all those who suffer mostly in silence. I am a member of RA Warriors and we all try to give each other emotional support and understanding. At least we are trying to gain further insight from each other. I know there are many more diseases that need a cure as well and don’t mean to sound greedy in my quest for a cure. I did the drug study for Humira many years ago and took this drug for about 10 years. At one time I did go into remission but it was short lived. I later changed to Orencia and this helps but as I sit here today in pain I know this is not the end all the biologics claim. Please continue the research until a cure is found! Not only because of the pain but also the internal problems that go along with it. With talk of PRD and RA should also come a discussion of pain management. All of the breakthroughs are great, but the pain, swelling and related issues are being ,IMO, overshadowed by this country’s “opioid epidemic “. For the first time since being diagnosed with RA back in 2005 I was almost pain free. 50 mcg of Fentanyl transderm every 3 days had me almost fully functioning. But with the CDCs guidance and the overrwatch of the monitoring agencies, my pain doctor is being directed to take me off the only thing that has worked! Somewhere in my genes is some kind of issuse with pain meds. My 2 sons and I all have a reduced response to opioids, which means to get any relief the dosing must be at the higher end of the scale. Under the new guidelines 90 mg morphine equivalent is the max dose for anyone, no exceptions. Just like how RA affects everyone differently, how each person responds to pain meds is also different. However the CDC in their infinite wisdom (sarcasm ON) thinks that a single dosing limit will work for everyone. As it typical, the Govt doesn’t care about the individual, only the masses. What a crock. Back in the pain game, again. I agree, Liz! Seems like we’re just spinning our wheels looking at some “new” version of the same thing. If we don’t understand what causes this disease, it will be difficult to stop it. Thank you Dana, for the Great post! And thanks to all the commentors on rawarrior for your insight – adding to my understanding and way to think about and try to describe what’s going so wrong re: RD treatment. The lies in the commercials are sickeningly dismissive. The pain that hunts us down is treated as a non-symptom. Their responses: get psychiatric treatment – or stop being a crybaby and get out there and exercise. (I AM trying to exercise! I used to love my exercise routine! But for decades now, the pain and the sickness have put up barriers, and exercise can cause brand new destruction I never completely recover from.) With everything I try to do, in any area, I have to remain cautious. To the FDA, to the medical associations, to the arthritis association, we are “arthritis patients”. God only will help us. The medical establishment and big pharma, will not. (how dare we criticize their medicines and methods! Don’t we know this form of “arthritis” is now controlled! Just stop your attention seeking, and get on with your life! …If only we could. Is there anything we want more? I actually do repeatedly thank God that Kelly has never stopped her attention seeking – for our attention and for the medical industries’. I have followed the blog for almost 5 years. If only I had found it sooner. It changed my identity, and how I approach trying to get this genetic disease treated. I have never found a more courageous community than the one posting here. I don’t know if I am up to their standards, but I am trying to be (some of the time, anyways, ha ha). I have taken notes from the blog for years; which is enormously helpful. But to have “RA Unmasked” at my fingertips is much better. I tried to read it all in one night (lol). But I can pick it up any time now to read, reread, and underline (cautiously, with a rular). If you haven’t bought it yet, try to do so (e-format or paper). I am eager for the next book. But I know how impossibly hard such an undertaking as “RA Unmasked” is. It’s hard to believe it’s actually been done. This is an impossible dream for anyone suffering from this killer disease. Thank you Kelly for all you do to enlighten people about this terrible disease call rheumatoid arthritis. I have not bought your book yet but I do intend to get it. I am so happy to have found the RA Warrior website. The interaction between those of us who have RA is amazing. I have made so many friends that are almost like family. Only someone with RA can understand what this disease can do and how better to cope with everyday struggles. I appreciate what you do and pray there will be a cure soon. God bless you! Welcome Kaye. I’m sorry you needed to find us, but glad you did.